Malcolm R. Campbell is the author of the contemporary fantasies, The Sun Singer, Sarabande, The Seeker, and the satire, Jock Stewart and the Missing Sea of Fire. He is also a prolific blogger, posting interesting articles and reviews, and collecting Book Bits, the most fascinating and relevant book-related links on the internet. I recently interviewed Malcolm to find out more about his new book and his writing practices. The interview is posted on my Pat Bertram Introduces . . . blog, but I’m posting a few responses here to whet your appetite to read more. I hope you will enjoy meeting Malcolm R. Campbell. Malcolm, What is your book about? 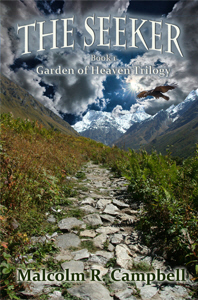 In The Seeker, David and Anne meet while working as seasonal employees at Many Glacier Hotel in Glacier National Park. He comes from the Montana high county where he is at home with totem animals, magic and mountain climbing. She comes from the Florida Panhandle where she is at home with botany, beaches and coastal swamps. Their intense summer romance leads them to believe they’ll be lovers forever. Typically, the realities of college life in separate towns get in the way. Then, when David’s intuition tells him Anne is in danger, he uses ancient magic to rescue her. However, cheating fate brings consequences and misunderstandings that threaten to drive them apart. The story was inspired by my work as a summer employee in Glacier National Park as well as my love of both the Rocky Mountains and the Florida Gulf Coast where I grew up. To my Florida friends, my going to Montana for summer work and Colorado for summer school was tantamount to traveling to another planet. The worlds are so different. So, I wondered whether two people from such diverse regions could maintain a relationship once the summer was fading away into the past. David Ward is very much like me. We both love climbing mountains, following our intuition, and consorting with totem animals. In the upcoming second and third books of the trilogy, my experiences are somewhat similar to David’s aboard a Vietnam-era aircraft carrier in The Sailor, and my work as a college journalism instructor leads to David’s teaching work in The Betrayed. David’s grandparents, the medicine woman Katoya, and the sheep rancher Jayee, are very influential in his life. Katoya teaches in magic. Jayee teaches him logic and the practical work labor-intensive jobs. Katoya and Jayee come from different worlds, having married for reasons of necessity, so they’re at odds with each other about almost everything. I had fun writing about their love/hate relationship and how it impacted their grandson. Yet, I don’t let them steal the show from protagonist David Ward, a mountain climber who really would refer working on the railroad to going to college, and Anne who is a very earth-centered, environmentally conscious young woman who doesn’t like what we’re doing to the planet. Your new book sounds fascinating, Malcolm. Looking forward to reading THE SEEKER. I’m quite intrigued, especially by your character, Katoya. Thank you, Deborah. Katoya is one of my favorite characters. We write what we know, at least, to some extent, so The Seeker should be “real world” interesting as well as an engaging work of fiction. Looking forward to it. Thank you,Juliet. I like mixing reality and magic to see what I come up with. Nice post, Pat. 🙂 Thanks so much for spreading the word. Always glad to help someone who has done to much to help spread the word about my books!